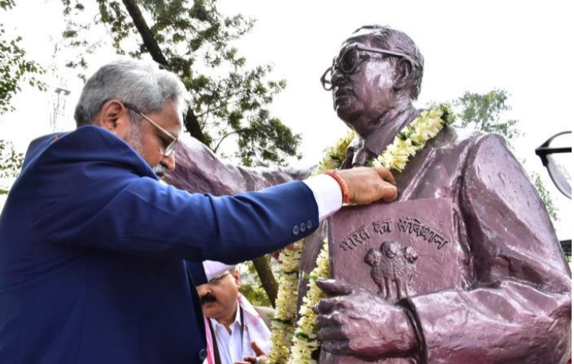 The Oil and Natural Gas Corporation (ONGC) installed a life-size statue of the great visionary Bharat Ratna Dr. Babasaheb by Ambedkar at the Deputy Commissioner’s Office premises in Sivasagar, on the occasion of the Mahaparinirvan Diwas observed on Thursday. Ambedkar, the Chief Architect of Indian Constitution, dedicated his entire life for the uplift of the downtrodden and underprivileged. An ONGC press communique issued by Corporate Communications division of ONGC Assam Asset, Nazira stated that initiative which started a decade ago, was given a fresh impetus by the present management of ONGC Assam Asset, finally culminated on Thursday by unveiling the statue by Executive Director, ONGC, Assam Asset, SD Maske in presence of DC, Sivasagar, Pallav Gopal Jha; SP, Sivasagar SK Sonowal and other dignitaries. Speaking on the occasion, Maske paid rich tributes to Ambedkar and highlighted the philosophy of Dr. Ambedkar, especially emphasizing Babasaheb’s relentless endeavor to foster equality, unity and brotherhood among all Indians. Maske further said that ONGC has always been a front runner in promoting Babasaheb Ambedkar’s vision and mission through various social welfare initiatives and will leave no stone unturned to implement projects for the development of the society. He thanked the Deputy Commissioner, representatives of Ambedkar Statue Erection Committee, Sadou Asom Anusuchit Jati Janajati Parishad and ONGC’s All India SC/ST Employees Welfare Association for providing all out support to ONGC for installing the statue. Jha, while thanking ONGC for the noble initiative said that installation of the Statue would go a long way to disseminate the vision of Babsaheb for development of the society. Jha further said that the District Administration had always got support from ONGC and aimed to work with ONGC for development of the society.